Not only can we order any name brand hood for you (like CaptiveAire or Greenheck), but we can also custom build a hood in stainless or galvanized steel to your specifications. 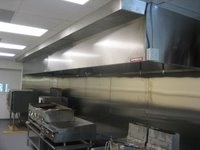 We install all hoods, replacement air components, ducts, curbs and fans. At your request we can also add a 'skirt' to your hood, prepare and seal the roof openings, and supply a 'cricket' that will wash rain away from any roof penetration you wish. We fabricate and install any stainless or galvanized wall metal, pass-through windows, or trim that is needed. Even if you already have your equipment or choose to buy it elsewhere, we are available to offer our same excellent service (above) to get your equipment installed and ready to operate. Have an idea for a custom cabinet to accomodate your specialty equipment? Need something unique that you can't get anywhere else? If you can dream it (and maybe draw it) we can build it. From bars and bar stools to pizza peels and toppings tables, we have made just about everything and we love a challenge. If you already have a piece that is well-worn and in need of repair, we are ready to help. We regularly weld cracked sinks, rebuild existing stainless tables, and much more. Bring in what you have and we'll fix it. For for information email Dave or call (512) 636-7727.